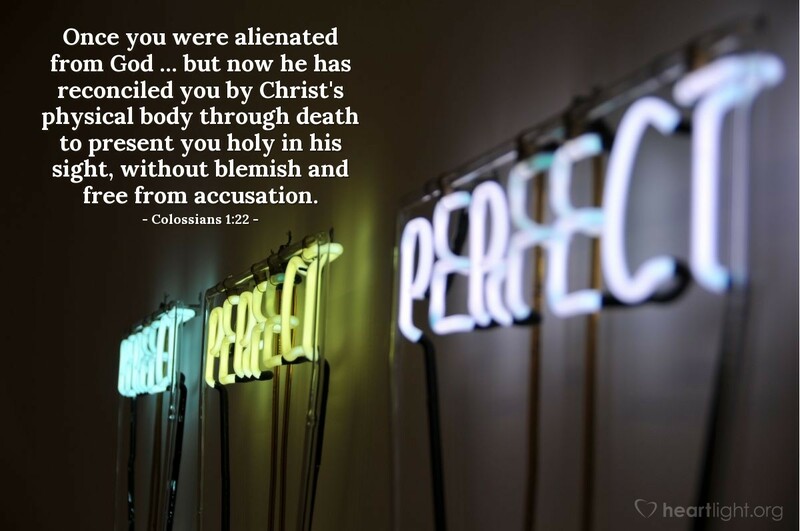 Once you were alienated from God ... but now he has reconciled you by Christ's physical body through death to present you holy in his sight, without blemish and free from accusation. "Christians aren't perfect, just forgiven!" You've probably seen this bumper sticker or something similar. In one sense this is absolutely true. But, from God's point of view, Christians ARE perfect. That's the incredible message Paul gives the Colossians. Because of Jesus' sacrifice, God does not see our imperfections. He sees us through Christ's perfection. Look at these concepts and marvel! Look at how God views you and give thanks! Be humbled by God's grace to us in Jesus and rejoice! Holy, without blemish, and free from accusation — there's nothing left to say but "Hallelujah!" Father, thank you for providing the sacrifice that makes me clean. Thank you for seeing my worth through the perfection of Jesus and his sacrifice. Thank you, Lord Jesus, for paying off my debt to sin and for sharing your perfection with me. May my life today, and everyday, more closely resemble the perfection you have given me by your grace. In the name of my Savior Jesus, I pray. Amen.